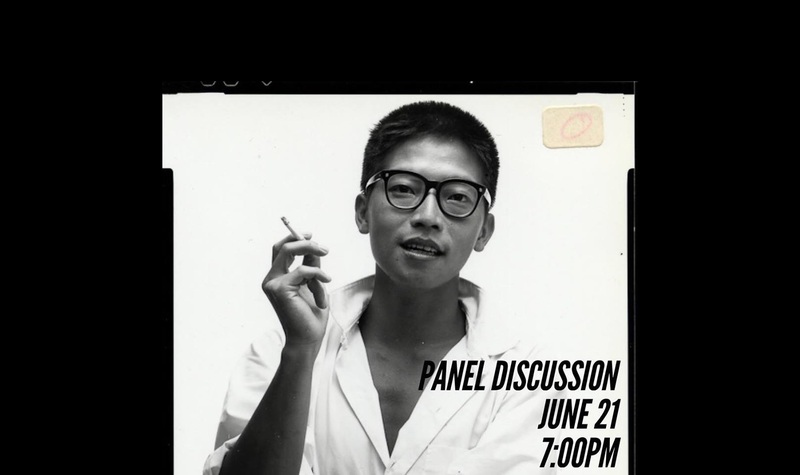 A sound recording of a discussion of Antonio Mak's art by David Clarke, presented at a panel on the artist held at Para Site Art Space, 21 June 2018, can be found at the end of this page. Arguably the most common schematic story concerning Western modernist art sees it as moving over time towards greater purity and autonomy. This involves an increasing abstraction as visual or formal qualities come to the fore. Art escapes from servitude to the written word, no longer being tied to illustrating pre-existing historical, mythological or religious texts. No narrative, no words, lie behind images any more, according to this grand story of the liberation of the visual. The sheer volume of theory that has been generated about modern art (by artists as well as by others) should perhaps lead us to consider this story sceptically. There are still a lot of words about artworks, around artworks, even if nowadays there aren`t so many words behind artworks. From the perspective of an artist working in Hong Kong, far from the centres of Western modernist culture, the heroic narrative of art`s escape from narrative might look less convincing, and what might seem elsewhere to be a contamination of the visual by the verbal might look more like an interesting and fruitful entanglement. Such indeed seems to be the case with Antonio Mak. Titles provide us with a starting point for our verbal response to images. They are words offered by the artists themselves along with their works, subsidiary gifts of a non-visual nature which we might be tempted to use as a foundation for our own spoken or written structures. Whilst the titles of Mak`s works are rather more important to his enterprise than those of some other artists, offering a useful way into his work, the ground they provide is not a stable one. Rather than being a clear signpost (to change the metaphor), a Mak title may in fact be pointing in more than one direction. A title, for this artist, may turn out to be a means of proliferating associations rather than of limiting and channeling them. Blue Elephant (1989) is a case where the title, at first, seems to willfully point us in the wrong direction. It is blue, of course, so that adjective can be applied to the sculpture in a nice straightforward literal way, but surely it is a human torso (one of the most common of Mak`s subjects), rather than an elephant? In fact, however, we are not so much being misdirected as being sent on a roundabout route so that we might return to the sculpture from an oblique, but more interesting angle. Words (but not those of the title) help pave the route back: Human bodies as well as elephants have trunks, and whilst we certainly see the trunk of a human figure here, perhaps we can also see the trunk of an elephant. Although not mentioned in this title, trunks do appear explicitly in Tree Trunk (1993). Where a tree trunk might be expected we find a human trunk, a straight case of substitution which Blue Elephant is unwilling to be satisfied with: the arm (not the trunk) of the human figure is the form which resembles the elephant`s trunk. We have a figure like those `duck-rabbit` diagrams in psychology of perception textbooks, which offer two mutually incompatible readings. Unless, that is, we are prepared to consider the possibility of an elephant-man, which after all was the subject of a recent film. The elephant man may seem at quite a distance from the visual evidence of the work itself, but we can get at him from another angle, that offered by the work`s Chinese title. The Chinese character for elephant (xiang) is an element of the character xiang (meaning an image or statue). An elephant therefore sounds like a good subject for a statue (in Chinese), but to make the elephant character into the image or statue character requires the addition of another element - the radical for man. A statue, therefore, might be viewed as a kind of man-elephant. 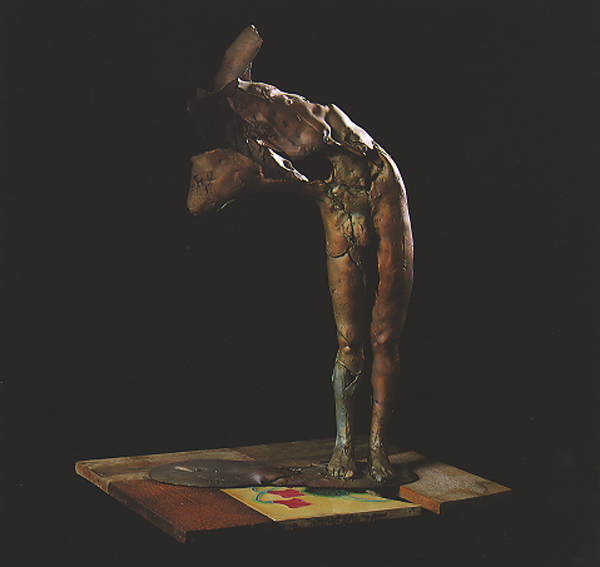 Horse Lover Goes West (1992) is a title which seems to point us to an occidental interpretation of the sculpture to which it belongs, or more specifically an American one. `Go West young man`, it seems to say, although when Mak himself went West as a young man, it was initially only as far as England - hardly frontier territory - where he was to study art at Goldsmiths College and the Slade School of Art. The obvious visual element to which the Western reference in the title corresponds is perhaps the horse, the key prop of the Wild West lifestyle (at least as depicted in movies). In terms of artistic reference one thinks also of the slightly tacky (but immensely popular) horse paintings and sculptures of Frederic Remington, Charles Marion Russell and their followers, which propagate the cowboy myth as enthusiastically as any John Wayne Western. Just as Blue Elephant turns out to have Chinese language associations as well as English language ones, so this sculpture too has Eastern references that balance its emphatically Western ones. Themes of opposition are, we will see, very common in Mak`s work at many levels, and here the title points both ways since its Chinese version (Mami Xiyouji) brings completely different associations into play. Xiyouji is the title of the Chinese classic Journey to the West. Much as he admires this tale of the adventures of the monkey king and his companions, Mak seems to be monkeying (horsing?) around here and introducing less exalted Hong Kong references as well. As a colloquial phrase in Chinese, da hua xiyou specifies bullshitting, the telling of fanciful stories, and given the context of horses and horse lovers we might be correct in imagining a reference to the wild dreams of the many fans of horse racing that exist in Hong Kong. Mak himself is something of a fan of horses: they appear frequently in his work and have been of interest to him from early days, since he grew up near to the racetrack in Happy Valley. Bible from Happy Valley (1992), like many of Mak`s sculptures, is made up of two seemingly incompatible elements. One is not surprised to see a man on top of a horse (as in Horse Lover Goes West), but a book on top of a horse has the kind of incongruity we have learnt to expect from Surrealist painting. Quite extensive visual fissures can, however, be crossed with the help of fragile verbal bridges. Bookies, for example, are men who keep books on horses (making their living from those horse lovers who dream of A Better (Better`s?) Tomorrow in the Vale of Happiness). Mak points out that the open pages of the book have a visual similarity to wings. This horse, that is to say, is not so much a literal as a `bookish` or literary one, a Pegasus. This particular winged horse won`t get far, of course, because his wings are of lead, a material not conducive to airborne activities. His fate, should he attempt flight, might be similar to that of the human figure in Book Lover I (1992). The most famous human flyer found in books is Icarus, who fell to his death through pride, but if that`s a sprawled cape rather than book-wings this could be some tragic comic book hero instead, a superman brought Down to Earth (which is the title of a 1978 piece). Gravity is serious, Book Lover I seems to say, but Gravity III (1993) initially seems to lack gravitas. 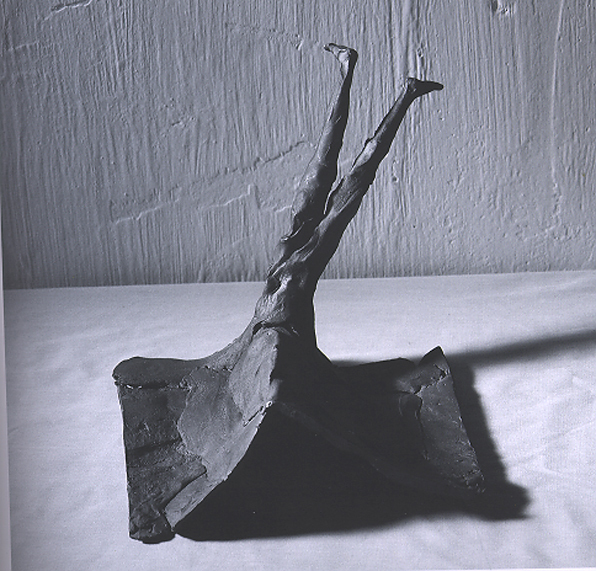 This drooping figure (like the wilting flowers depicted on the base) seems a joke, a reference perhaps to the process of modeling itself, which is subject to interference from gravity if armatures are not properly constructed. More grave associations are there to be found, however, since spinelessness is as much a moral failing as pride. The reference to the process of modeling in Gravity III is paralleled by the art-about-art quality of certain other pieces. Craft (Vehicle) (1992) seems to indicate a concern with technique by the word `craft`, and the shell which partially surrounds the torso (and which is echoed by the brackets in the title) reminds one of the casting process - albeit that it also brings to mind the fish-shaped dishes in which fish are often cooked in Thai restaurants. Book Lover may also have an oblique reference to the technique and material used to create it: both the downfall of Icarus and the production of this sculpture involved lost wax. A different sculptural technique, namely carving, is foregrounded in one of Mak`s earliest works, Wood (Inside Out) (1973). By making a tree out of wood (which is made out of a tree) Mak brings subject and material into relationship with each other. There is a literal as well as an illusionistic relation between the carving and its subject, and since the tree trunk is only partially defined we are more aware of the woodiness of the sculpture than we might otherwise be: we are conscious of the wood that remains uncarved, as well as of the wood which has had to be removed. An unfinished carving (one thinks of Michelangelo`s Slaves) can give the feeling that the artist has found the subject of his or her work embedded within the material. That certainly seems the case here, and (to return to the realm of verbal associations) one might note that trees are often found in a wood, just as wood is found in trees. We may not always be able to `see the wood for the trees`, but Mak seems here to be more worried that we might not see the tree for the wood. Perhaps this has something to do with Chinese language concerns: whereas in English there is room for confusion between `wood` (the material) and `wood` (a collection of trees), in Chinese the character mu meaning `wood` (as a material) can also have the meaning of `tree`. I have already noted how trunks provide a verbal link between two of Mak`s most common subject elements, trees and human torsos, and Green Trunk of 1989 and Fig. Tree of 1991 provide further instances where trees and human bodies are brought together in his sculptures. A similar link, between trees and books, is provided by the fact that they both have leaves, although unlike the former connection this is not one which the sculptor himself draws attention to in his titles (even though the pun works in Chinese as well, with the characters for leaf and for page both having the same sound ye). We might, therefore, begin to wonder exactly where to draw the line in our verbal response to the sculptures. A veritable forest of verbal associations seems to surround the works, and it may seem dangerous to wander too far from the main path - might not someone who branches off and leaves the trunk route (root?) get lost in a linguistic thicket, or become too `bookish` in their approach to a visual art form? We`ve already seen the fate of the Book Lover, someone with his `head in a book` who came to a sticky end. My own view is that we are always actively making sense of art, and to follow the main path is merely to uncritically accept the senses that others have already made in their verbal wanderings. The non-verbal or resolutely optical response to art, rather than being an escape from the textual forest, is a path constructed of the words of Clive Bell, Clement Greenberg and many others. If meaning is something we make, rather than something we unload from the artwork, then perhaps the idea of a path leading to a complete comprehension of a painting or sculpture is a misconception. When closure of meaning is understood as something perpetually postponed, perhaps there are only meandering byways, and the highway to the citadel of truth begins to be reclaimed by the forest. One characteristic of Mak`s art which stands out is the persistence of his engagement with certain motifs over an extended period of time. This continuity is to be found not so much at the level of subjects, as at the level of the elements out of which he creates those subjects. Like Chinese characters (which are constructed for the most part of pre-existing units which tend to be meaningful in their own right) Mak`s sculptures seem to be made, by a process of addition, from elements which are a recognizable part of his repertoire of images. Whilst the combinations in which the elements are joined lacks the predictability required of a language, there is nevertheless a sense in which we are watching their transformation from context to context, rather than merely looking at each work in isolation. Meanings attached to elements shift over time, and I want to view this as a kind of thinking with things, a use of sculpture as a medium of thought. Some of the elements of Mak`s sculpture have already been introduced. We have discussed examples which illustrate his interest in horses, torsos, trees and books. There is also a persisting interest in ladders, steps and chairs, and these items may be taken as a category in their own right of objects which are man-made and have a close relationship to the human body. 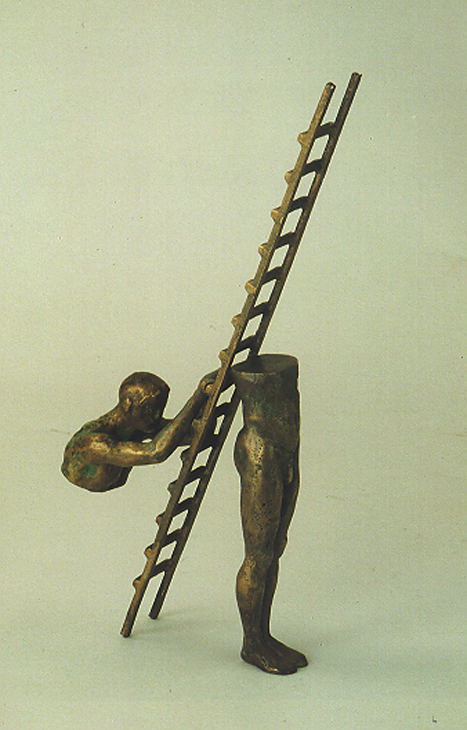 Such a relationship is explored in sculptures such as Man with Ladder II (1982) and Man with Ladder III (1982), as well as in Man, Chair (1978) and Figure on Staircase (1982). One theme, most particularly explicit in the latter, is the way tools tend to mould human existence, when ostensibly they merely serve it. Flights of stairs can become symbolic thresholds, entry points into another realm. Although his use of the flight of stairs motif predates his discovery of it, Mak is interested in the fact that a flight of stairs can be found in a hieroglyphic illustration to the Egyptian Book of the Dead. The persistence of elements in Mak`s work can be illustrated by the appearance of the image of a chair in a painting of 1973, titled West Meets East. In this student piece, completed before the artist made his transition from two to three-dimensional work, the verbal plays we are by now accustomed to is already taking place. The chair is placed near to an image of Chairman Mao shaking hands with Richard Nixon, an event which had taken place earlier in the year of the painting`s creation. A more recent chair-man is Lift (1983). Here the chair sits on the man, rather than the man sitting on the chair - they both have legs and backs, so perhaps it`s not so hard for their roles to be reversed - and a visual reminder is at the same time created of the seat-like form found on the ceremonial hats of Chinese mandarins. One theme of Mak`s work not yet mentioned is the tiger, and I would like to consider it a little to demonstrate more clearly the migrations an element is subject to when it enters the arena of his work, the variety of meanings it is able to attract to itself over time. One could say that the tiger`s primary associations are with wild nature, but Mak`s tiger is from the beginning a `bookish`, literary animal, with associations gained from William Blake`s brightly burning forerunner that make it representative of the imagination. It plays this role most diagrammatically in Man`s Nature, an etching of 1972, where it is opposed to a flight of stairs. The latter element in that context is given associations with rationality (and its `step by step` logic), and a human figure is shown faced with the dilemma of choosing between the two options as if this were a modern-day version of Annibale Carracci`s Choice of Hercules. Although Mak is interested in Henri Rousseau`s representations of tigers (he was able to study the National Gallery`s Tropical Storm with a Tiger whilst a student in London), he began gathering the visual sources which fed his own tiger sculptures at a time before he would have been aware of modernist art history. Whilst still quite young he started gathering a scrapbook of tiger images culled from a variety of photographic sources. In doing this, Mak was imitating the practice of his father, a commercial artist, who collected images of various kinds as reference material for his work. Whilst associations derived directly from Western Romanticism (William Blake and Henri Rousseau) or indirectly (via the commercial advertisements which exploit its heritage) are important to Mak`s tigers, they are not the only ones. We have already, in examining Mak`s titles, encountered cases where what might at first sight seem purely Western turns out to have a submerged Chinese dimension, and the same is true with the tiger iconography. The tiger has a long history of associations in Chinese art, and one could point to Two Minds in Harmony (Tokyo, National Museum), a work in the manner of Shi Ke, as a direct ancestor of Mak`s Easy Rider (1993). Despite the American film alluded to by the title, this is actually one of the most overtly `Chinese` works that Mak has produced, containing as it does an image of a Bodhisattva on the back of a tiger. In both this and the Shi Ke work the figure is in an inwardly directed, meditative state of mind, and is shown as in a harmonious relationship with the potentially fierce beast. Buddhist ideas, in which Mak has had an interest, supply the context for both works. In each case harmony is attained not so much through mastery of the tiger as learning to coexist with the tiger within us, our essential nature. Here (unlike Bible from Happy Valley with its horse and book) the coexistence of diverse elements is seen as an inescapable part of the human condition, not a bizarre departure from it. Easy Rider`s Chinese title (Cheng) has the everyday notion of `ride` - which meets with the associations of the English title - but it also brings explicit Buddhist associations since the same character can also mean `vehicle` - in the sense of the `greater and lesser vehicles` (the Mahayana and Hinayana [Theravada] schools of Buddhism). In addition to carrying religious associations, Mak`s tigers are also being used to help think out positions on political matters. Such an idea is not completely without precedent in Chinese art. The Lingnan School painters of the earlier part of this century, for instance, used tigers (and other animals found in pre-modern East Asian art) as political symbols, resignifying elements of traditional iconography in order to introduce contemporary references without creating too great a breach with the past. Without any explicit link to the Lingnan school practice, Mak is also using the tiger as a symbol for China. Specifically, his tigers appear in works which address the vexed question of Hong Kong`s relation to China in the run-up to the 1997 hand-over of power. Whereas the Lingnan School tigers were painted within China, with that animal`s proverbial strength becoming a symbol of China`s need for a new boldness, Mak`s tigers have been sculpted outside of China, and the aggressive quality of the tiger is therefore constructed as something to be wary of. The tiger signifies `them`, not `us`, and a them whose imminent arrival has scared many people into emigration. Like Easy Rider, Sleepwalker II (1991) has a human figure on a tiger`s back. Seemingly Mak is again offering advice on how to develop a working relationship with unavoidable powerful forces, albeit that those forces are conceived of here as political rather than psychic. Flight into emigration appears not to be the option proposed, and a mode of co-existence seems possible if the tiger and its powers are not taken too seriously. Again the riding figure has closed eyes, but this time it is sleepwalking rather than meditation which is taking place. `So long as he doesn`t wake up he`ll be alright` is Mak`s comment on this work, but it is hard to see it as an image without ambivalence. Is sleepwalking, after all, such a positive thing, even if it does shield us from realities? Since the somnambulist as well as the tiger is in forward motion, it looks as if he`s going to fall off the front of his mount, in which case his protective sleep is surely going to come to an end. And, in any case, can peaceful co-existence between two very different entities be presented as a solution wholly without irony when that notion is the very one which political rhetoric proposes in the phrase `One country, two systems`? Sleep seems to be coming to an end - for better or for worse - in Good Morning II (1993). Here the outstretched arms, albeit that they are similar to those of the sleepwalker, and also recall the actions of a diver about to take the plunge, seem (because of their context) to refer to the stretching motions of someone who is waking, or perhaps to the early morning martial arts-based exercises so popular in Chinese societies. Sleepwalker I (1991) is very closely related to Good Morning II, although here the orientation of the figure has been reversed, so that it faces in the same direction as the tiger. Whatever the merits of the sleepwalker`s strategy for dealing with tigers, it seems clear that the approach being adopted in Last Tango with Tiger (1993) is not one being recommended by the sculptor. `That guy is really in trouble [says Mak], but he doesn`t know it`. The human here (representing, one feels, those in Hong Kong - businessmen and others - who so assiduously court the Communist government) seems to have completely forgotten the essential nature of tigers. Such un-natural behavior on the animal`s part cannot be expected to last for long - both parties, after all, need their `freedom of expression`. Of course, we do see tigers acting tamely in the circus, but if the human thinks he`s in control here he`s mistaken. The movie reference in this title to Last Tango in Paris is not so reassuring as the one in Easy Rider: the dancing will soon be over, and then what? The tango, despite its romantic qualities, has a deadly undertone to it. Mak is aware of a Chinese saying which compares serving a ruler to serving a tiger, in that they both might bite you, and our dancer faces a similar danger to a court official. This, after all, is no paper tiger. To specify more closely the range of meanings carried by the tiger in Mak`s work we can compare it to the horse, some associations of which have already been introduced. Both animals connote nature but, although a wild horse is a possibility, it is generally seen in Mak`s work in a tame state. Whereas riding tigers is a dangerous activity, the riding of horses carries no such association in Mak`s sculpture. Men and horses associate easily, perhaps because horses have been bred over time to perform a useful function for man, to fit his needs. They are tools, in a sense, like the ladders and chairs which appear elsewhere in Mak`s art. The tame quality of horses when compared to tigers is illustrated by Bound to Win (1992), in which two horses are seen dressed up in dinner jackets. We cannot imagine tigers attired in this fashion, but the notion that even for a horse such dress is un-natural, a form of constraint, is introduced by the word `bound` in the title (although `bound` in another sense is what a horse might do if it was set free). We are back to the world of horse racing, and although this pair are dressed like human `winners` in the race of life, a horse is never `bound to win`, no matter how much of a favorite it might seem before the start. I have already had occasion to discuss artworks by Mak in which quite diverse elements are brought into relation, and in some cases those differences might be thought of as direct oppositions. The tigers and stairs of the untitled 1973 etching (with their connotations of imagination and rationality) can stand as an example, as can the encounter of Mao and Nixon (who may be taken as representing respectively East and West, or Communism and Capitalism). Mak seems explicitly interested in treating oppositions of various kinds in his art, and this can be explored most effectively by a consideration of pieces in which he uses a common element of his work not yet discussed, namely the mirror. Mirrors offer a possibility for exploring the theme of opposition because of the way they bring objects face to face with their illusory doubles. Their property of reversing right and left is, of course, another way in which oppositions are introduced, and one which is shared with the process of printing from an etching plate. Although the use of mirrors in three-dimensional artworks is perhaps not so very common, a great many two-dimensional artworks include images of mirrors. Mak seems particularly interested in Not to be Reproduced (1937) by Magritte, which depicts a mirror that reflects the back of the figure before it, rather than the front. In his exploration of this conceptual Surrealist`s image, Mak attempts to replicate its effects with a real mirror, achieving this in Atomical Relationship (1974) by means of a line drawing of a figure`s back view executed on a transparent surface. If the figure appears to be looking at the back of his head does that mean he is behind the mirror-image rather than in front of it? A concern with fronts and backs can be found in Mak`s work as early as 1972. In West meets East he introduces two complementary versions of a female figure, related to Botticelli`s Venus, in which aspects of the body`s front and back have been combined - one, for instance, has a bottom visible as well as a face. These figures reappear in another work (What`s Behind Venus? of 1973), where a transparent material is again employed as a surface for images. One of the front-back images is put on each side of a piece of glass, so that a superimposed complete front and complete back image can be read from both the front and the back of the work (because each of the front-back images has a front and back to it). Front and back are further played with here since the image is placed in a frame which enables a shift of orientation: its front and back can be reversed. It might seem apposite to include an image of a bottom in a work which quotes Botticelli, but there is room for disorientation if we attend to the word play too closely. Bottom and behind may refer to the same bit of anatomy, but as directional terms they refer to different dimensions. The situation is further complicated in West Meets East by the pair of compass points in the title (reversed from the usual order in which they are verbally paired), as well as by the presence of the two national leaders, who may be taken (in terms of political metaphor) as standing on the extreme left and right. Mak`s Last Tango with Tiger, as we have already noted, may be a documentation of the awareness that left and right can often be on the same side, and Nixon`s visit to China can be taken as marking the beginning of the process, so visible in Hong Kong today, of capitalists finding common (economic) cause with communists. Mak gives us one further reverse to hint at his cynicism concerning the historic meeting of opposites he depicts: Mao the leftist appears on the right of the photo, whilst Nixon the rightist is on the left. `Tricky Dickie` may have been a dexterous or adroit politician, but on the other hand that Vietnam War-era president had his sinister side. In Playing Escher (1974), as in Atomical Relationship, Mak creates in three dimensions an illusion similar to that first proposed in a purely two-dimensional image (in this case, M.C. Escher`s Reptiles of 1943). Here, however, the mirror is a tool introduced to solve the problem, rather than an item which exists in the original image (although elsewhere Escher does show an interest in reflections, his Magic Mirror of 1946 providing the closest comparison). Mak produces a circular arrangement of tigers which recalls Escher`s circle of reptiles: whereas the latter start as two-dimensional images on a page and become three-dimensional before returning to their flat world, the former start as three-dimensional images and become flat reflections before returning to their three-dimensional world. One could rather neatly refer to Mak`s work as providing a `mirror-image` of what happens in Escher`s lithograph, if it were not that the notion of a `starting point` makes less sense where there is a closed sequence of identical images than it might elsewhere. Although we know that the reflected tigers are dependent on the bronze ones (and not the reverse) we cannot help but wonder whether these are two-dimensional tigers who have come out briefly into a three-dimensional world. Because of the arrangement, the bronze tigers read as opposed to the reflections which are parallel to them in the illusory mirrored space, although in fact the reflections are actually of the bronze tigers which appear to be at ninety-degree angles to them. Atomical Relationship was apparently Mak`s first piece of sculpture, and therefore mirrors can be seen to have played a part in his move from two- to three-dimensional work. Both it and Playing Escher, as I have just been arguing, are explicitly three-dimensional versions of two-dimensional works by other artists, and the latter can in addition be read as thematically concerned with the emergence of two-dimensional beings into the three-dimensional world. Such a theme is also present in Heads and Joker (both of 1973), which include a series of three overlapping versions of the same profile head. The first is a black silhouette or shadow, the second uses conventions of representation to imply the illusion of a third dimension, whilst the third is modeled in shallow relief. A further indication of desire to escape into the third dimension is that the image of the three heads is placed over the larger canvas of the painting (in a small frame of its own), rather than being executed directly onto it. It is joined to the larger canvas by a hinge at its (and the larger canvas`s) edge, thereby permitting it the freedom to swing out into the dimension not occupied by the canvas surface and its painted forms. That Mak continues to use mirrors in his later works is perhaps an indication that he has not lost interest in two-dimensional images altogether, since they provide a way of introducing such flat images into otherwise three-dimensional works without a return to drawing or painting. We can see such an encounter between two- and three-dimensional images within a single piece in Inside Out (1974-82), where the theme treated in Atomical Relationship of a figure`s opposition to its mirror image is carried one stage further. Here opposites meet and even interpenetrate, the figure in the mirror appearing to move out into real space at the same time as the real figure moves into illusory space. In this work, which can be taken as a more three-dimensional version of What`s Behind Venus? part of the bronze section of the sculpture belongs to the penetrating figure, part to the emerging one. 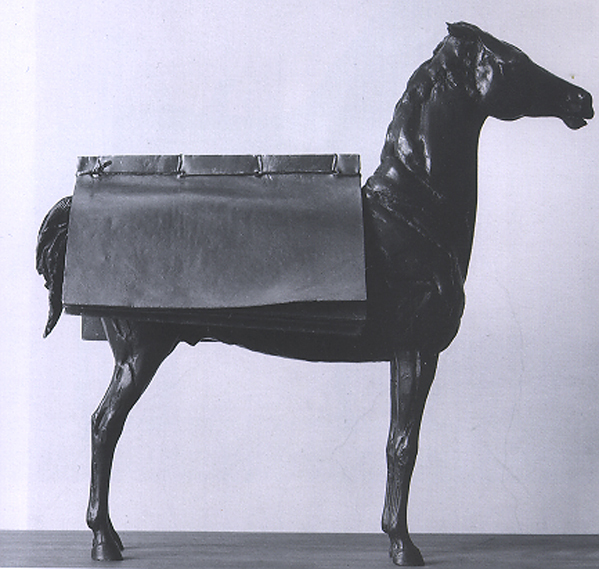 The same is true of Chair (1977) and Horse, Crossing I (1977-83), which repeat the idea of Inside Out with two of Mak`s other recurrent sculptural elements. In Horse, Crossing I, however, there is an elaboration not found in the work using the human figure: the horses appear to cross each other on paths that intersect at right angles. A similar - although less extreme - difference of angles is present in Chair, but because of the inanimate nature of the subject here there is not a sense that two chairs are in motion into and out of the mirror. Instead the chairs seem to be suspended between two worlds, solid objects paradoxically sharing some of the same space (an idea Mak also explores in Chair on Chair of 1977). Mak`s interest in mirrors is informed by many textual sources. He has heard, for instance, of a belief that there are beings in mirrors who copy our movements because they have been conquered by us, and of a people who supposedly avoid looking at reflections of themselves because they deem them to be false images. A scientific source for his speculations on reflections is Martin Gardner`s The Ambidextrous Universe, whilst more literary sources are H.G. Wells`s The Plattner Story (in which a man returns from a journey in the fourth dimension with his heart now on the opposite side of his body) and, of course, Lewis Carroll`s Through the Looking-Glass. This latter text is claimed by Mak as a direct inspiration for Inside Out, since whilst reading about Alice stepping into the mirror he found himself attempting to visualize the details of the process. In Heaven and Hell (1993) Mak returns to the idea of the mirror surface as a threshold to another realm, enriching the metaphorical associations by means of the title. In this work he combines a mirror with another of his habitual sculptural elements, the flight of steps, which (as I have already noted) also carries the connotation of a symbolic threshold. Whereas Mak`s sculptures are usually relatively small and manipulable objects, Heaven and Hell is an installation piece, set into the ground. Steps lead down to a mirrored surface placed at an angle, in which your own reflection becomes visible. The spectator takes the place of the human figure in Inside Out, moving to meet its double. Because of the steps, the oppositions offered by the mirror are supplemented by an opposition between up and down (the directions metaphorically associated with Heaven and Hell). But because of the possibilities of the mirror there is a reversal, and in walking down into the work we seem to be descending into the (reflected) sky, rather than the earth. We can interpret this as a statement about the interchangeability of opposites, perhaps, a reading which could gain some support from a consideration of Root (1990). That sculpture also seems concerned with a confusion or similarity between opposites, specifically between the roots and the branches of a tree, which are represented as more or less indistinguishable. That downward motion should not be necessarily read as negative is also suggested by the title of Rebirth (1990), which depicts human bodies with heads downwards as if taking a journey of rebirth to some Jungian regenerative underworld. The feet, perhaps as a symbol of the rebirth mentioned in the title, are covered in foliage - recalling Daphne`s transformation into a laurel tree as depicted by Bernini in his Apollo and Daphne. From a certain angle of approach to Heaven and Hell one has a strong illusion of a doorway below ground level leading to an unbounded empty space. Steps lead down into what seems to be a void that has been discovered below the earth`s surface. The strength of this illusion is tempered only when one gets close enough for one`s own reflection to appear, thus identifying the plane of the mirror surface, and laying bare the simple mechanics of the work`s effects. Mak, if he does offer an intimation of the numinous, is quick to undermine it, and perhaps the whole notion of walking down towards heaven could be read in a similarly ironic way as a comment on human delusions. Like Icarus or the Book Lover, we are being (literally) brought down to earth, and in our case this happens at the very same time as we appear to ascend into the heavens. Because of its title, we may be led to see an influence from William Blake`s The Marriage of Heaven and Hell on Mak`s installation piece. The theme of opposites and their reconciliation or co-existence which appears here and elsewhere in Mak`s work is explicitly treated in Blake`s text, which tells us to accept oppositions as necessary to human existence. `Without contraries is no progression` is one statement of this principle in The Marriage of Heaven and Hell, which also asserts that `opposition is true friendship`. If one wanted to, one could find further resonances between Blake`s text and Mak`s art: the contrast between tigers and horses in his work, for instance, could be related to Blake`s statement that `the tygers of wrath are wiser than the horses of instruction`. Mak`s opening up of an illusory void beneath the earth in Heaven and Hell could be related to a line about `melting apparent surfaces away, and displaying the infinite which was hid`, as well as to the passage where the narrating voice describes being led down a cavern by an angel until `a void boundless as a nether sky appeared beneath us`. As with so much else in Mak`s art, however, one can also find a Chinese dimension to Heaven and Hell: the notion of Yin and Yang as dynamically interacting polarities underlying all phenomena is at least as valuable a source for the idea of the complementarity of opposites as anything Blake can offer. This Chinese philosophical source, which Mak is happy to acknowledge, is perhaps most clearly influential on Walking Figure I (1977), a body constructed of two separate elements, which intertwine (like the dark and light areas of the yin/yang diagram) to create one whole. Since in Walking Figure I the right side of the head is linked to the left side of the torso (and vice versa), one is also reminded by this sculpture of the discovery that the two sides of our body are controlled by the opposite sides of the brain: a reversal and an opposition built into our biological hardware. When Mak applied for postgraduate study at the Slade School of Art he apparently submitted a double statement: an optimistic one he had written in the evening was attached to a more pessimistic one written the next morning. Not only has his interest in opposites and their interaction continued since that time, but one can say that his works have explored different, and even opposite, positions on opposition. Sometimes more than one position seems available even towards the same work, as I have tried to argue with respect to Sleepwalker and Heaven and Hell. Rather than seeing these slippages between belief and ironic distance as a negative inconsistency, however, one could choose to regard them as evidence of a positive ambivalence, a refusal of easy, final positions. By avoiding a voice of authority in his sculpture (however seductive such voices might seem), Mak allows us space to participate in the process of investigation he has begun. Antonio Mak died in June 1994. This essay, although it was first published in association with a retrospective exhibition of his work held in 1995, was written between 1993 and 1994, at a time when Antonio was still in good health. It draws upon discussions we had been having about his art, and there are a couple of direct quotes from an interview of 1 October 1993. Antonio was able to see and respond to an earlier draft of this essay, and I chose to keep it in the present tense in which that version was written. Much has changed since the time in which this essay was written, both in Hong Kong and the rest of the world, but I haven’t attempted to rewrite the essay to reflect this and have left it as a document of the moment it was written. I feel prompted to recirculate it now after participating in a June 2018 panel discussion about Mak held at Para Site Art Space. I hope it will help bring Mak’s work to the attention of a new generation. Sound recording: A discussion of Antonio Mak's art by David Clarke, presented at a panel on the artist held at Para Site Art Space, 21 June 2018.